Energetic rhythms fill the air at San Ysidro’s Willow Elementary on weekday mornings when more than 100 TK through sixth-graders, joined by their older siblings, moms, dads and even a few abuelitas, walk or run laps around the school’s soccer and kickball fields for 30 minutes. Members of Willow’s new Walking Club carry bright yellow cards for staff members to stamp for each lap. After each mile, students can pick prizes from the treasure chest, such as a pencil, bracelet or ball. Luis Ramos, a lifelong San Ysidro community member, was named principal of La Mirada Elementary School on Aug. 10 after serving in an interim capacity over the last year. 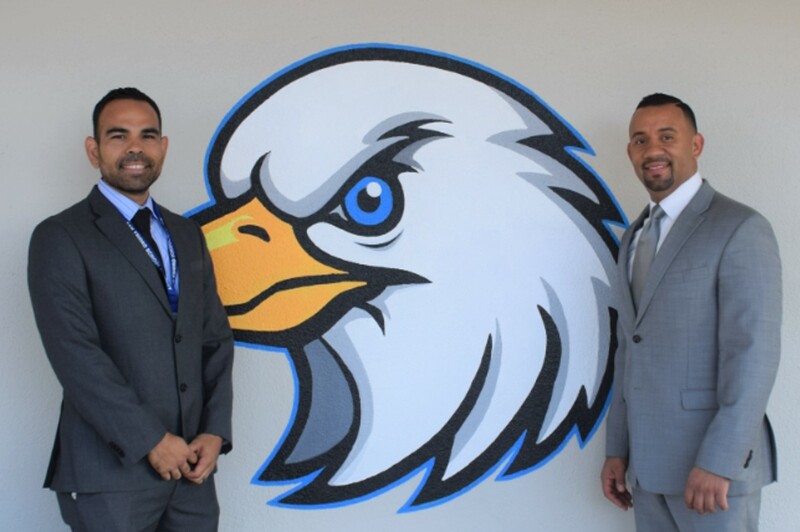 Ramos joined the San Ysidro School District in 2005 as a sixth-grade teacher at La Mirada. He taught eighth grade and served as an assistant principal at San Ysidro Middle School before becoming assistant principal at La Mirada. Ramos was raised in the South Bay and graduated from San Diego State University with a degree in education. Spanish-speaking parents in the San Ysidro School District learned fundamental English skills – alphabet, numbers, how to tell time, days of the week, colors and more – through a free class offered this spring by the District. Now, following the success of the inaugural English as a Second Language (ESL) class, SYSD will work with partner Southwestern College to offer two introductory English classes this fall at La Mirada and Willow elementary school parent centers, and a second-level ESL class at the District parent center. 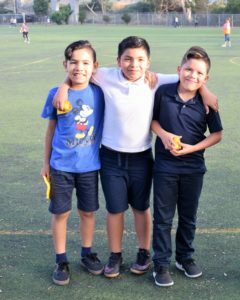 With seven schools and a preschool, the San Ysidro School District serves more than 5,230 students. It offers a rigorous and engaging instructional program, with the strong belief that every child deserves a high-quality education that effectively prepares them for life beyond its classrooms. Follow-up Story: San Ysidro School District middle school principals Maria Rodriguez and Roberto Carrillo recently got the chance of a lifetime – learning to incorporate technology such as YouTube, Google Hangouts, Google Classroom and virtual reality into classrooms as part of a first-of-its-kind training course at Google’s Mountain View headquarters. San Ysidro School District Superintendent Dr. Julio Fonseca and Board of Education will celebrate renovation of La Mirada and Smythe elementary schools at 4 p.m. Thursday, Aug. 31 at Smythe Elementary, 1880 Smythe Ave., San Ysidro. Over summer, the two schools received $27.9 million in upgrades funded chiefly by Proposition C. Crews gutted each school and replaced drywall, air conditioning ducts, ceiling tiles, lighting, doors, carpet, furniture and more. Tours of both schools – located about a block from each other – will follow. San Ysidro School District will host its third annual District-wide resource fair from 10 a.m. to 2 p.m. Saturday, Aug. 19 at the District Office, 4350 Otay Mesa Road, San Ysidro. Backpacks filled with supplies will be provided for K-8 students in need. Free food and drinks will be available for all attendees. Additional resources for community members will include job assistance programs, housing and food programs and information on county benefits. The San Ysidro School District will kick off the 2017-18 school year on Thursday, Aug. 17 with newly reconfigured schools to better meet the needs of its nearly 5,000 students, families and staff. By restructuring grade-level offerings, the District will enhance teacher collaboration, expand educational opportunities and distribute enrollment equally across its schools. SYSD’s focus on a science, technology, engineering and math (STEM) inspired curriculum will include coding classes for kindergarten students as well as an expansion of courses designed by Project Lead The Way. Actor Tony Plana’s musical theater program will also be offered to students District-wide. Nearly 90 San Ysidro School District students entering seventh grade this fall are getting a jumpstart on the academic 2017-18 school year by studying algebra and geometry during summer break. The goal of SYSD’s inaugural Summer Bridge Program – inspired by the Advancement Via Individual Determination (AVID) college-readiness program – is to provide students with an opportunity to accelerate their math skills so they can later take Advanced Placement math courses in high school. Follow-up Story: Spanish-speaking parents in the San Ysidro School District learned fundamental English skills – alphabet, numbers, how to tell time, days of the week, colors and more – through a free class offered this spring by the District. 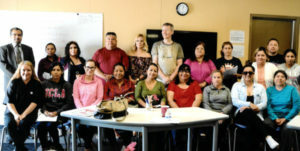 Now, following the success of the inaugural English as a Second Language (ESL) class, SYSD will work with partner Southwestern College to offer two introductory English classes this fall at La Mirada and Willow elementary school parent centers, and a second-level ESL class at the District parent center. San Ysidro School District’s Board of Education has approved a 2017-20 Local Control and Accountability Plan (LCAP) that establishes a District coordinator of English language services for the 2017-18 school year and continues programs that have led to gains in English language arts and math state tests. The LCAP describes how San Ysidro will spend $56 million to promote achievement, school climate and parent engagement, with an emphasis on professional development and student/family well-being. The District will also update its technology plan, adopt new math textbooks and review new English language arts textbooks.